South Africa is a medium sized country that would fit into the USA eight times. It has a diverse population of 55 million people and is affectionately known as the ‘Rainbow Nation’. Wine growing is limited to the south-western region of South Africa, in the Western Cape Province, which is an area the size of Greece. The world-famous Table Mountain is at the heart of this region. It is one of the oldest mountains on earth: six times older than the Himalayas, and five times older than the Rockies. South Africa has been making wine for over 350 years. The first grapes were pressed in 1659. The wines reflect the best of the old and the new; they present fruit-forward styles with elegance and finesse. The South African wine industry is one of the most technically advanced in the world of wine. There is an extremely rigorous Wine of Origin Certification Scheme, introduced in 1973, which guarantees that the wine is what it says it is. Each bottle carries a certification seal to guarantee that the claims regarding vintage, variety and origin on the packaging are true. South Africa has more certified Fairtrade wines than any other country. There are five officially demarcated production regions – they are based on the massive variations in soil, climate and location between regions. The regions are: Breede River Valley, Coastal, Klein Karoo, Olifants River and Boberg. There is a commitment to environmentally sustainable wine production and wines can be certified by Sustainable Wine South Africa, which is part of the Wine and Spirit Board. Grapes are produced in harmony with nature, which allows vineyards to flourish alongside their natural habitat. The Biodiversity and Wine Initiative is a unique partnership between conservation bodies and the wine industry. UK – South African wine is the fourth largest category; in 2011, it overtook French wine. Germany – More wine is exported to Germany than any other New World producer. Sweden – Number one in Sweden and popular all over Scandinavia. Russia – A rapidly growing market. USA and Canada – South African wine sales have been growing steadily. 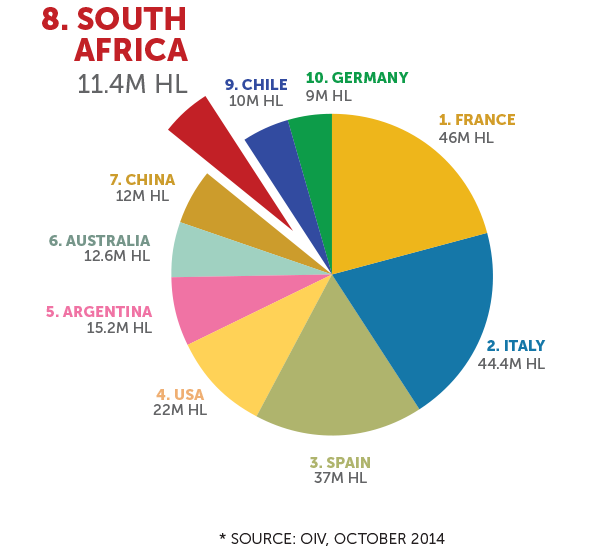 Netherlands – South African wine is the second biggest category. Asia – There is a significant opportunity for growth and development in Asia, particularly in China, Japan, Korea, Indonesia and Thailand. Africa – A rapidly growing market. Brazil – Holds huge potential. South African wines have a purity and intensity in flavour that comes from growing vines in harmony with the environment. The Cape mountain slopes and valleys form the ideal habitat for the wine grapes. South Africa has the oldest viticulture soils in the world. The Cape Winelands area is made up of mountain ranges and valleys – each creating a wine region with an individual character. A Mediterranean climate with sun-drenched summers and mild, wet winters contribute to ideal cultivating conditions. Surrounded by two oceans – the Atlantic and Indian – that generate winds which cool the vineyards during hot summer days. This slows the ripening process and intensifies flavours. Made up of mountain ranges and valleys, each creating a wine region with an individual character and microclimate. Over 95% of the wine is produced in the Cape Floral Kingdom – with over 10 000 plant species, it has more than the entire Northern Hemisphere. This Kingdom has been created by a diversity of soils (produced from granite, sandstone and shale), climates and geography, which in turn has created a treasure trove of winemaking possibilities. As a result, South African wines have a huge array of flavour and aroma profiles, which lead to wines with intriguing character and drinkability. 100 000 wine-grape hectares cultivated, 1 000 000 000 litres of wine produced per year. 3 323 grape farmers, 564 wine cellars, 276 000 people supported by the wine industry. Ninth largest area under vineyards in the world, eighth largest producer of wine in the world. 4% of the worlds wine are produced by South Africa. South Africa has its own unique grape variety – Pinotage – a cross between Pinot Noir and Hermitage (Cinsaut). Diverse Flavours has established a long term working relationship with a growing selection of South Africa’s finest wine estates and distillers. Our partners are award-winning, critically acclaimed producers of fine wines and spirits.